Yesterday’s Financial Times ran a positive review of Leo Bersani and Adam Phillips’ psychoanalytic exploration of human intimacy in their new book, Intimacies. Summarizing the work the FT‘s Salley Vickers writes: Taking the form of a conversation between this congenial but not necessarily like-minded pair, Intimacies explores the pitfalls and possibilities of human intimacy and the damage that a zeal to know ourselves and others can wreak. The exchange of views reflects the authors’ philosophies: differences are the source, not the stumbling blocks, of intimacy; distance should enhance not diminish pleasure in others’ company; and it is disastrous to take things personally. Read the full review on the Financial Times website. . . .
Last week in the June 16 New York Times cultural critic Edward Rothstein had an interesting commentary on the New York Botanical Garden drawing on Robert Pogue Harrison’s new book, Gardens: An Essay on the Human Condition, to help him place the concept of the garden in the wider context of western history and demonstrate its enduring cultural and historical importance. Rothstein writes: From medieval cloisters, botanical gardens made their way into universities, beginning with the University of Pisa in 1544. Later the garden’s terrain expanded with botanical expeditions, oceanic trade and imperial adventures. Victorian botanical gardens could be encyclopedic in scope, arranging their displays according to Latin classifications of species by the Swedish botanist Carolus Linnaeus. Now, in our humid, dry, cooled or heated greenhouses, we shun such systematic display. Instead we replicate ecological niches, miniature worlds that supposedly show nature at work: the desert, the rainforest, the tropical pool. But peel back the environmental stagecraft, and the scientific cultivation continues with even greater passion… There is something moving about the entire enterprise. In a remarkable new book, Gardens: An Essay on the Human Condition, Robert Pogue Harrison (who wrote similar meditations on cemeteries and on forests) elicits some . . .
Robert Pogue Harrison, author of Gardens: An Essay on the Human Condition, was a guest last Friday on the public radio call-in show On Point from WBUR in Boston. Host Tom Ashbrook questioned Harrison about the literary and philosophical aspects of the garden. The call-in segment of the program elicited discussion of community gardens, gardens and church history, and secret and sacred gardens. In the second half of the program Irene Virag, garden columnist at Newsday and a writer for several gardening magazines, joined the discussion. You may also read an excerpt from the book. . . .
Jonathan Rosen, editorial director of Nextbook, wrote an appreciative review of Robert Pogue Harrison’s Gardens: An Essay on the Human Condition for the June 7 edition of the Wall Street Journal. Titled “Paradox Among the Petals,” the review begins: The rabbis of the Talmud counseled that if you are planting a tree and someone tells you that the Messiah has come, you should finish planting your tree and then go out to investigate. Robert Pogue Harrison implies something similar in his rich and beguiling Gardens: An Essay on the Human Condition. Gardens, though they offer peace and repose, are islands of care, he writes, not a refuge from it. That is why they are important, since care is what makes us human. 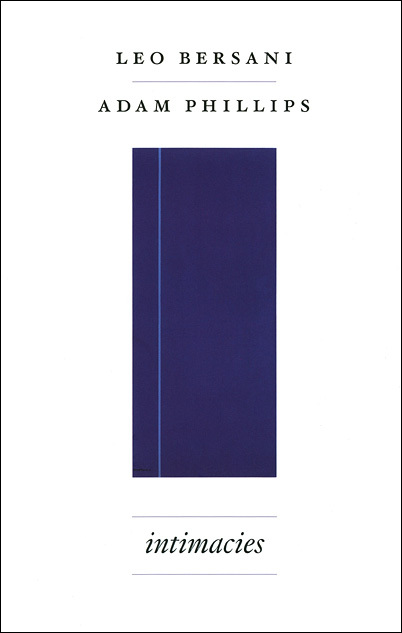 This is the third book by Harrison that we have published and each has been a meditation on humanity and the natural world. As a professor of Italian literature, Harrison’s work is steeped in classical and modern literature, but as the quote above suggests, he also draws deeply from the religious and philosophical traditions. His previous books include The Dominion of the Dead and Forests: The Shadow of Civilization. Update June 11: Gardens was also reviewed in today’s . 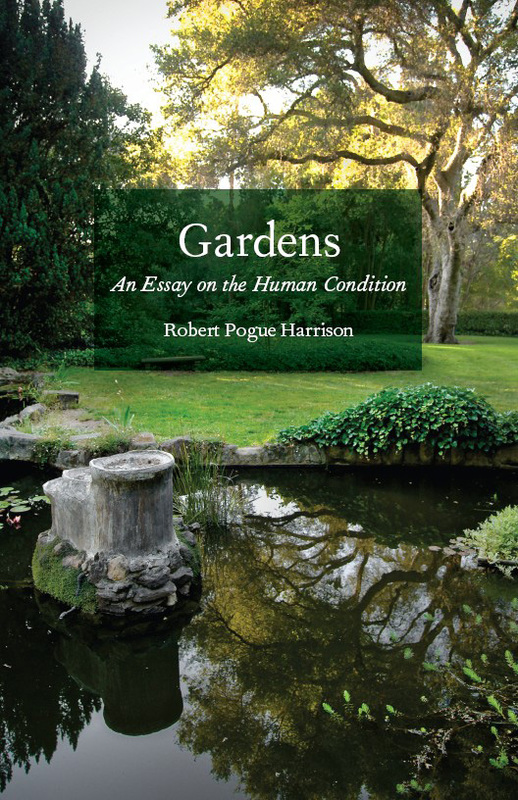 . .
San Francisco Chronicle reporter Susan Fornoff recently talked with Stanford University professor Robert Pogue Harrison about his new book, Gardens: An Essay on the Human Condition. Harrison uses gardens both literally and figuratively for a philosophical exploration from antiquity to the present, showing the connections between horticultural cultivation and the cultivation of the human mind. Fornoff’s engaging article appeared today in the Chronicle and discusses gardening, the culture of consumption, and human happiness: Harrison’s … excursion through literature and history revealed a gardening ethic of care that the garden he tends at Stanford University—that of young minds, not plant seedlings—leads him to believe is in some jeopardy. “This gardening ethic is very much in danger these days, where the emphasis on cultivation has given way to an emphasis on consumption,” says Harrison, asserting that a Stanford student would be more inclined to inspect another’s backyard on HGTV than to investigate one of the many campus gardens. “We live in a kind of frenzy of consumerism which forgets that the true source of human happiness is not in the consuming but in the cultivation, in seeing something grow, or caring for something that is not yourself. And I don’t know how . . . Nothing banishes winter’s lethargy more quickly than that first sight of the green of spring, as trees bud and our gardens, once again, burst into glorious bloom. For Robert Pogue Harrison, it’s not just the depths of winter that gardens help us escape: throughout human history, gardens—both real and imagined—have been essential places of refuge and comfort in the face of a harsh, often violent world. Employing the richly learned and allusive approach that he brought to his classics, Forests and The Dominion of the Dead, Harrison explores here the central importance of the human urge to nurture and cultivate gardens. Beginning with ancient conceptions of the garden as a place for the quiet work of self-improvement that is crucial to serenity and enlightenment, Harrison then travels widely through the history of Western culture. Enlisting such varied thinkers and writers as Voltaire and Calvino, Boccaccio and Arendt, Harrison profoundly demonstrates the role the garden has long played as a necessary, humanizing check against the degradation and losses of history. Read the press release. . . .
Scott McLemee interviewed Neil Gross yesterday for his “Intellectual Affairs” column at Inside Higher Ed. 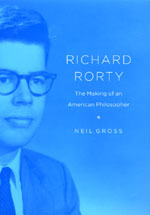 Gross is the author of Richard Rorty: The Making of an American Philosopher and he discusses his new book as a work in the sociology of ideas, not just biography and intellectual history. What’s the cash value of doing that? Gross explains: My goal in this book was not simply to write a biography of Rorty, but also to make a theoretical contribution to the sociology of ideas. Surprising as it might sound to some, the leading figures in this area today—to my mind Pierre Bourdieu and Randall Collins—have tended to depict intellectuals as strategic actors who develop their ideas and make career plans and choices with an eye toward accumulating intellectual status and prestige. That kind of depiction naturally raises the ire of those who see intellectual pursuits as more lofty endeavors…. I argue that intellectuals do in fact behave strategically much of the time, but that another important factor influencing their lines of activity is the specific “intellectual self-concept” to which they come to cleave. By this I mean the highly specific narratives of intellectual selfhood that knowledge producers may carry around with . . .
What do they do after High School? The Chronicle of Higher Education is running an article by James M. Lang on the current state of undergraduate education titled “The Myth of First-Year Enlightenment.” In the article Lang cites Tim Clydesdale’s recent book, The First Year Out: Understanding American Teens after High School to explore modern students’ reactions to their first introduction to academe: You’ll recognize this story: Intelligent but naïve high-school graduate heads off to college… discovers how limited her worldview has been. Her consciousness is awakened. She emerges from her first year of college a changed human being, with more thoughtful views on religion, politics, and her own identity. Our institutions… hawk the tale to prospective students and their parents on Web sites, in brochures, and on campus tours: You will come back from your first year a changed man or woman. You will be on the path to your new and more enlightened life. You will have had the best four years of your life. 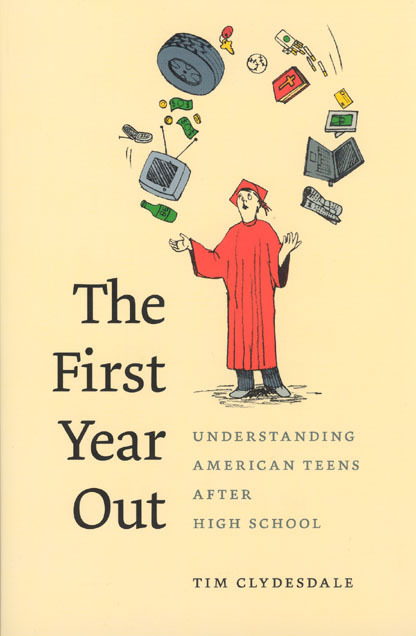 Not so, according to Tim Clydesdale, an associate professor of sociology at the College of New Jersey, and author of The First Year Out: Understanding American Teens After High School.… “Most of the mainstream American teens I spoke with . . . 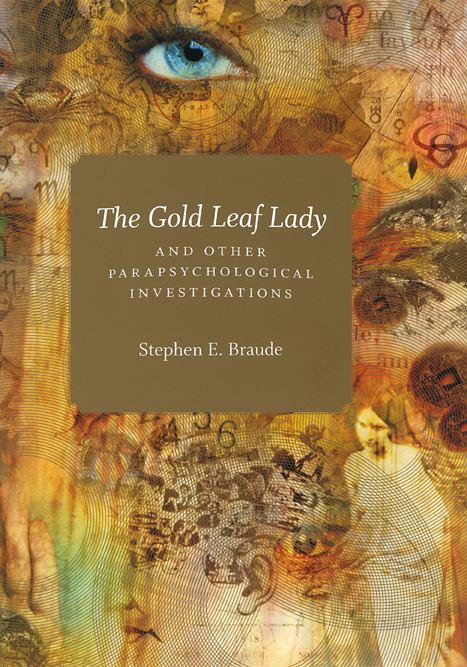 The Chronicle of Higher Education is currently running a great article on Stephen E. Braude and his new book, The Gold Leaf Lady and Other Parapsychological Investigations—a fascinating not to mention entertaining exploration of the paranormal from an academic’s point of view. Scott Carlson writes for the Chronicle: A professor of philosophy at the University of Maryland-Baltimore County, Braude is a past president of the Parapsychological Association, an organization that gathers academics and others interested in phenomena like ESP and psychokinesis, and he has published a series of books with well-known academic presses on such topics. His latest, The Gold Leaf Lady and Other Parapsychological Investigations, is sort of a summing up of his career, filled with stories of people who claimed to have otherworldly abilities. The writing is so fluid that the book at times seems made for a screen adaptation. (In fact, Chris Carter, creator of The X-Files, contributes a blurb to the back of the book. Braude advised Carter on a screenplay he is writing.) But Braude also includes some dense philosophical arguments—especially in a chapter about synchronicity, in which he ponders whether humans can orchestrate unlikely coincidences through psychokinesis, the ability to move or influence objects . 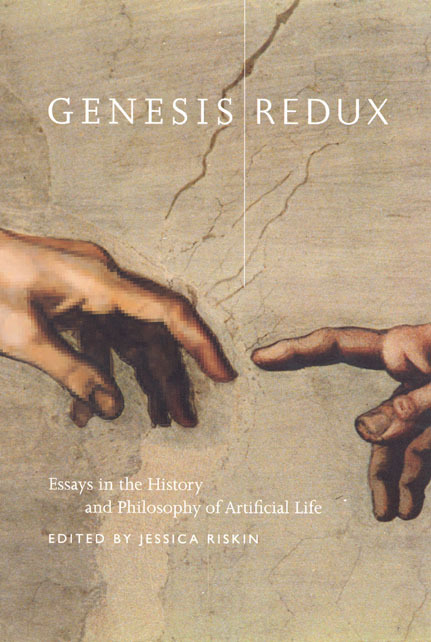 . .
Jessica Riskin’s Genesis Redux: Essays in the History and Philosophy of Artificial Life was recently given a great review by science fiction writer Greg Bear in Nature. Riskin’s book collects seventeen essays from a conference of distinguished scholars in several fields who bring a historical perspective to this most contemporary of scientific topics. And as Bear notes in his review, the result is a particularly comprehensive treatment of the history of artificial life. Bear writes: The strength of Genesis Redux lies in its scholarship and range of topics. Clockworks, mechanical toys and their influence on biological concepts are presented in fascinating detail. Joan Landes introduces us to the Hoffmanesque works of Jacques de Vaucanson’s feminine flautist and (excreting) duck, and to the flayed, preserved and posed cadavers, the écorchés, of Jean-Honoré Fragonard: there is a dancing fetus and a very naked man staring in horror, jawbone in hand. Landes delivers a lively analysis of our reactions to the abject and uncanny, the frisson so beloved by fans of Dr Frankenstein. The review continues: Genesis Redux takes the time to shed light on areas I would not naturally consider, and thus enlightens and expands the topic. Its cautious perspective—the enthusiasms of . . .